0 Comment March 18, 2017 Like? In Season 2, Episode 18 – POST SHOW – Philippe Laurent the CEO of EasyLive answers your questions live in the chat room! We review his cloud based video streaming services that make live streaming easier and more reliable. With EasyLive we help take live streaming to a broadcast level with the ability to have redundancies and backup streams. EasyLive shares with us the 3 layers of RTMP (Video, Audio and Data) and explains some of the advanced solutions for monetization and data optimization. Philippe revealed some very interesting live streaming monetization options using the data channel of RTMP. Because the EasyLive platform is API Driven users can use the Brightcove VideoJS player to display a layer of monetization over live streams. Philippe used the example of a selling a players jersey directly after a goal was scored. You can overlay images and links (basically anything in HTML) on your Video/Audio RTMP stream. Access to the data channel is restricted with most free CDN’s such as Facebook and YouTube Live. Paul Richards: Okay, if I pull up the chat in this window it will actually cut you off Tess but why don’t we just go ahead and go straight to Tess here, Tess why don’t you tell us what are the questions we’re getting. Tess Protesto: Okay we have quite a few questions here one that I saw was can the automation be time based? Paul Richards: what do you think about that Phillippe can the automation be time based? Philippe Laurent: So basically everything is like pull through in API so it’s real time so basically let’s say you do sports this is when we get the data then the process occurs so it has to be as fast as possible basically. Tess Protesto: Okay, we had double on this question, is there built in intercom communication feature so that the broadcaster can talk to someone remote without that chat being live streamed? Philippe Laurent: No, for that we don’t because usually people will use a separate tool like I don’t know hangout? You have already like a lot of solution, very good on the market so maybe at some point we will integrate it in the platform but the use case we have with most of our customers is that most of them don’t need that for the moment. Tess Protesto: Alex said he is curious about stream lapse integration because he does a lot of gaming productions. Paul Richards: what is streamlabs? Philippe Laurent: So there is a direct integration with stream live and so basically here the use case is you …let’s say you play counter strike or whatever game like online and you display it on twitch for example you can have like a prebuilt template, custom, and you do basically the direct integration that’s the typical thing just like in HTML case so either you code it yourself or you use pre-built sound play that you can find on stream labs, mercy or other platform that exist on the market. Tess Protesto: This might answer that question but can encoding be done on easy live or those it has to be done before reaching easy live? Philippe Laurent: Yes it has to be done locally because basically when you take a raw file from a camera, the bandwidth that you have cannot support basically the load of the raw file, you must encode locally first. Tess Protesto: okay, does your platform do live trans grading server side? Some of this is like Chinese to me. Philippe Laurent: so maybe the person means transcoding or trans mixing meaning that you can change the parameters of your bitrate and your resolution I think that might be the question so basically yes and No. yes, let me give you an example, let’s say you publish to [03:32] 1080p, 10mb/sec, you now put on the YouTube support back twitch limit to 720p, 64bit/sec and 4mb/sec after that it shoots with without transcoding services. Facebook live block at 35/sec 720p, 3 or 4mb/sec so basically in outputs we will deliver the exact same option to all of the platform we won’t make a different between YouTube and Facebook because on our point of view it makes no difference. Very few people can watch 1080p today and so 99% will go 720p or below and so that’s why we don’t make differentiation between output, I know that some people say “Okay, the limit on YouTube is let’s say 720p, 5mb/sec and twitch is 720p, 4mb/sec and I want to make the difference on both platform” I can bet whatever you want no one can make the difference with your eyes, it’s not possible so that’s why there is no point in doing that it will cost more money to the customer in the end so we send the exact same option to everyone so we can transcode between input and output but in the output we made a choice to not make differentiation between targets. Tess Protesto: Okay, what else do we have here. Is there a display that shows bitrate? Or is he asking if we have an example of that. Philippe Laurent: That shows the bitrate that we use in the platform? No this one we don’t because usually …I mean we never had a question about that I don’t know, we have the data so if you’re interested in that you can use the HTML element basically to display whatever you want by default our tools won’t do it but if that’s something that is important for your customers you can use the HTML side. Tess Protesto: How do our viewers get easy live after this stream? Philippe Laurent: So they don’t because we don’t deal with the viewers basically we stand in-between the local production and the video platform that you’re using, let’s say Facebook life or YouTube so basically let’s say that Paul and Tess will be using our solution it’s not through easy-live that you will see it. 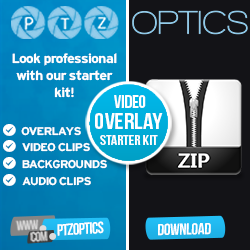 Actually no one will know that they use easy live so you will go on the YouTube channel of PTZOptics® and you will find your content here all on the Facebook page we don’t deal with final audience, we’re B2B company and we stand in-between the local producer and the video platform where you want to publish your content. Paul Richards: …and then you set them up with a custom quote and not to mention somebody is going to win an easy live …we can’t forget about it so I’ve already got it up here so let’s go ahead and do that, this is going to look a little bit sloppy but I’ve got to do it this way I think, we did a lot of custom stuffs today. Okay so this ended 145 total entries and let’s go ahead and roll the winner, thank you for sticking around everybody if you have entered this contest we definitely want you to be able to win. Joshua Steinmetz, have you seen him in the chat at all? Tess Protesto: I’m not sure, not that I recall, I can’t see the spelling so I’m going to butcher it. Philippe Laurent: So basically we have two ways of selling the platform basically. So everything is SAS on the SAS model so it’s like video subscription or a cost per events so since we are B2B we have like either like a monthly fee with the 1 year engagements, it starts at $300 a month for the premium package and for the enterprise package it goes at $800 per month and then you have various limitation between each package obviously and then we have a custom package for advance needs so people with those 10 hours a day 65/sec, 10 output you know? Something that is high quality and basically we charge on the minute rate so we charge you basically $1.99 per minute just for the road price and then depending on the commitment you can have along the year we can reduce to low price so it will depend if you have like a one shot event it will be like $2/minute so $120 per hour so it’s somethings that’s not that expensive but then if you do 10,000hrs/year of course you won’t pay that price it will be discounted. Paul Richards: That makes a lot of sense so it seems like right now it’s contact you guys get a custom quote cause you’re not trying to just jump into the water and get a whole bunch of people at a set price at this point because you’re really testing the waters a little bit with a platform that you could explode, I mean you can get… if you can just make it easy, I can see so many people who just want to stream to Facebook and have their logo and little things like that will be able to stream to YouTube and Facebook at the same time and not even use all the advanced features that you have and then on the other side of the boat I see a lot of people who want that redundancy and they want to have like the television style broadcast opportunities that they never had before so I can see it kind of from both ends which puts you in an interesting position because you’re going to have a lot of customers that are interested. Philippe Laurent: We hope so. Paul Richards: I thought we would just maybe show off our beautiful layout here, here we are, happy saint Patrick’s day everybody we’ve got Phillippe Laurent here who’s going to be answering your questions live here on YouTube like we always do, so yeah and the pricing has changed, last time there was a little bit of shock about the pricing, now it’s cheaper, now it’s different. Tess Protesto: Can you stream to your own website? And how would that be done if so. Philippe Laurent: That’s a good question. Basically, we are input, graphics and output agnostic so you can publish wherever you want we don’t have any limitation, so you can go to your own website through a custom [10:50] but then you need to have like the internal skills to know how to set up an agnostic server, how to use live stream or those other solutions basically to have it on your website but definitely you can go to your custom website. Basically we’re all partner with [11:05] and we are labelled by [11:07] so it’s like a big CDN basically that’s proof first the professionalism of our company and then you can go custom on this one, we partner with DaCast, we are global partner for YouTube, Global partner for Facebook live and Global partner for twitch and we get to [11:27 – 11:29] I don’t know if in the audience some people use elemental encoder but we are partner with them as well. Paul Richards: DaCast is going to be not on the show next week we’re going to have Tom Sinclair from streaming idiots on the show next week but DaCast has been so nice to give us a free …it’s $600 worth of live streaming on DaCast on their live show now how would you work with DaCast would you actually stream from easy-live to DaCast? Philippe Laurent: That’s correct. Actually we have a specific integration with DaCast so DaCast is a very good platform especially for people who want to host their content on their website and so we have direct integration with them where you don’t need to use any [12:09] you just basically click on the, DaCast logo, put your credentials and that’s it. You hit publish and it will go straight to your channel. You don’t need to set up or configure anything. Paul Richards: Wow and I know DaCast is really, really amazing when you get into those streaming scenario where you actually want to charge ticket and charge people for watching your live stream and have it hosting on your own website, they really get into that. Philippe Laurent: They are very professional, it’s a very good platform and very reliable. Anyone who wants to use basically their own solution on their websites DaCast is a very, very good provider for that. Philippe Laurent: But we have some solution for monetization, so basically its more on the custom package because it’s an advanced feature. Let’s take an example. You are a company that control all the work flow so you use maybe DaCast or another solution similar, you control your video player on your website basically through the [14:02] we can basically send you data, it means that every graphics that you see on your video player can be computable so one use case for that. Let’s say we play a game together and you Paul, you just scored a goal, I could display your jersey in the layer, in the video player and it can be clickable and so when the audience click on it, it goes to any store and people can buy your jersey in like 2 clicks, so that’s very advance feature but that’s part of the custom package. Paul Richards: Okay because of the HTML integration that you have it really opens up a lot of doors? Philippe Laurent: it’s separate of the HTML, it’s really through the [14:50] you have three channel, video, audio and data and so through data we can pass information making basically like a layer on top of your player clickable, real time but you need to control your player, if you don’t? let’s say you use Facebook live or YouTube or another, it won’t work because those company they control the video player and you can’t modify nothing on it. But if you control your own video player, let’s say you use Video JS or something like this, you can just make clickable every graphic on the player with this and that’s drives money. Paul Richards: That is really, really cool. Tess Protesto: One more question for you Phillippe, is there a limit on the number of CDN you can stream to simultaneously? Tess Protesto: Robert is very interested, he said which RTMP would you suggest? Paul Richards: and also he’s asking …what is that other question he has there? Tess Protesto: What is Video JS? Paul Richards: Yeah, what is Video JS I was wondering that too. Philippe Laurent: So Video JS is a player basically, it’s a company that has been bought by [16:41] couple of years ago and they provide a player that you can customize. Paul Richards: and guitar got to say 4 to 8 is enough …you know we only stream to YouTube and we do that because we have a small community of live streamers and broadcasters who watch our show we want to have them all kind of have their own community, I do understand streaming to Facebook and YouTube at the same time. Is it illegal to live stream to Facebook and YouTube at the same time? Streaming to Facebook and YouTube Legality! Philippe Laurent: It’s a good question. Facebook’s terms and condition that you can’t find because you need to go on developers.Facebook.com, it’s probably there. It’s mentioned that you can’t on our platform we warn you, we warn you that it’s forbidden and if Facebook notice it you can be banned. But then in real life, no one cares and everyone does it, it’s just that basically at some point, the point of view of most of the people who do that whatever solution they using, whether they use [18:27 company names] or whatever the company basically it’s not like, you can’t ask for exclusive content, if you don’t pay for that, so at some point you come clean, you go on Facebook but you can’t go on YouTube without paying for it, so I understand Facebook point of view on that, I understand customers point of view, I don’t know how this is going to work out because that’s a tricky question so I don’t know. Us as global partner for Facebook live we warn our customers about that but then we can’t control it because even if we’d be blocking them on the platform, on the control room, within our solution you can have like several instances running at the same time so if you can’t do it from one instance you can just choose 2 instances and you will do exactly the same so someone wants to go around it will always be able to do so. Paul Richards: I wonder if we should start streaming to Facebook and YouTube at the same time? Tess Protesto: …I would love to, from my end because I love Facebook streaming, I love the reactions. Philippe Laurent: but you have plenty of tools where you can aggregate bulk chats also, you have like things like [19:56] like SAS solution like this where you can aggregate several chats and moderate all of them in one place. But Facebook is pretty good for audience like to target the right audience, especially when you go to multiple Facebook pages like the audience you can reach on our point of view is where the experience is greater than YouTube, YouTube most of our customers that does YouTube have fewer audience than any other platforms. Tess Protesto: I feel like the only people that will get flagged for that are really large audience type companies. Paul Richards: I don’t think we will get flagged for it. Paul Richards: I guess we’ll just have to start doing it to just try and see what people think about it, a lot of people do and we can even live stream to twitter, you can live stream to twitter with yours as well right? Philippe Laurent: yes, of course. Paul Richards: You could do Twitter, Facebook and YouTube all at the same time. Tess Protesto: I would love to play around with easy-live. Paul Richards: well we definitely going to and we need to get more familiar with it because we are going to be using it at NAB and a whole bunch of other things. So Phillippe thank you so much for coming on the show, congratulation Joshua for winning an easy-live license that is going to be super fun for you to play with, we’re playing with it, I’ve had nothing but good things to say and from my experience, I’m just about 30 years old now, I’ve been in the industry for about 7 to 8 years depending on how you look at it but everything is moving to the cloud, everything, if you’re not moving to the cloud, everything. If you’re not moving to the cloud? You’re probably going to get left behind, we saw that with video conferencing, they had hardware based video conferencing codex now nobody uses them, everyone uses skype or go to Web-x or zoom and it’s all on the cloud now, the same thing is going to happen with live streaming, it’s just how long is it going to take? In my mind when I was using easy-live it wasn’t quite as quick as v-mix or wire-cast but from what you’re telling me it actually may be close so I mean it’s all going to go to the cloud someday and you guys are way ahead of everyone else. Philippe Laurent: it’s just that basically the issue is not easy-live or other competition, the issue is [22:30] basically with wire-cast for example of v-mix, when you have several video sources, it’s frame accurate but when you ingest [22:43] doesn’t have a time base so it’s not frame accurate and that’s the issue, the issue is the protocol itself so that’s why with our platform we don’t recommend to ingest like let’s say 4 video feed at the same time if you’re live streaming a football game or basketball game because they will be delay in-between each feed and even if you could on my point of view will make no sense because on each source you will need one internet connection and one encoder and at some point it will cost you more money than having a local switcher so it’s better to switch camera’s locally using like v-mix or wire-cast it will be more precise but then everything except for that move it to the cloud it would be faster, easier and you don’t have to worry about graphics and stuffs like that you can do all that in the cloud there is no added value to do it locally. Paul Richards: Very, very interesting and I love the HTML stuff, I love the API stuff, streaming Lab stuff I love the monetization through that third RTMP channel, I didn’t even know that existed, it’s always a good time having you on Phillippe, thank you so much for doing it, thank you to all of our viewers and take care everybody. Philippe Laurent: Thank you, Happy Saint Patrick’s Day!